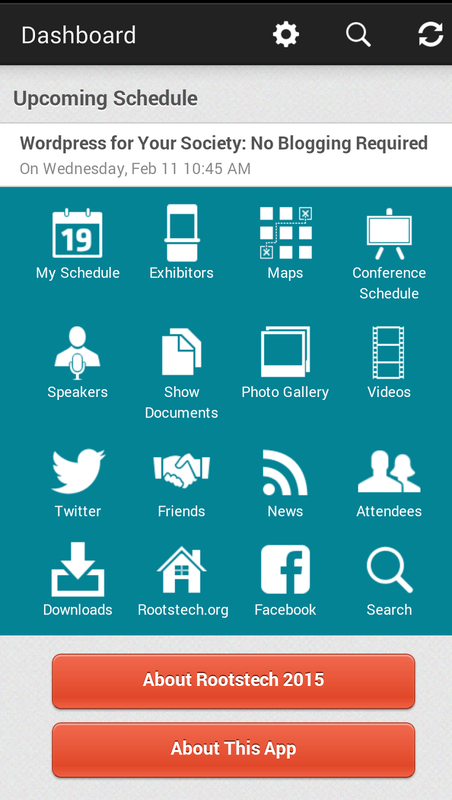 Every morning and evening I check the Rootstech app on my smartphone to scan the list of attendees for Rootstech 2015 and send out friend requests to people I know from the geneasphere. It doesn't take long because it's a very short list . So far I have just 13 friends and have sent out requests for another five or more. Thanks to those who have accepted my friend requests and those who have extended the hand of friendship to me. I know the Rootstech app has problems but it is a good (has the potential to be excellent) tool to have in your pocket or purse. The usefulness of any database/tool is dependent on the quality of the data it contains. The Rootstech organisers are doing their bit by providing schedules, maps, exhibitor and speaker information and social media links. But those who are attending are not pulling their weight. If this was a gardening or golf conference I might understand the attendees' hesitation to use a smartphone app. Rootstech is supposed to have a focus on technology so I would imagine that the majority of attendees would either be proficient in the use of technology or have a positive attitude towards technology and be willing to try out new apps and tools. I would like to know in advance which of my genimates will be amongst the crowd that will be gathered at The Salt Palace. One of the highlights of such a gathering as Rootstech is the opportunity it creates for one to meet our online geneafriends in the flesh but we need to be able to locate them. If we submit our details to the Rootstech app and make our profiles public then we will give others an opportunity to plan their meetups in advance. Once the madness that is Rootstech commences there will be little time to arrange meetings. How about joining the Appy Crowd? I am happy to accept friend requests but, if I don't know you and you don't have a Public Profile then I will be wary (especially if you use the name of a sportsman).